Other announcements include the world's largest UHD, and new content partnerships. Samsung has just announced the year's TV lineup during a press conference here at CES 2014 in Las Vegas, Nevada. 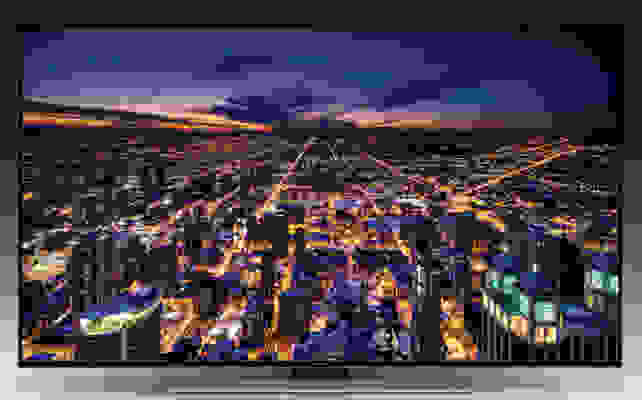 Alongside the recently revealed 110-inch UHD TV, the company debuted new UHD and LED series, as well as a UHD Evolution Kit. Joining last year's F9000 UHD TV is the new S9 series, in 85- and 110-inch iterations (the latter is allegedly the largest UHD TV in the world). Both the UN110S9 and the UN85S9 will utilize Samsung's Quadmatic Picture upscaling engine to transform 720p and 1080p content into something more worthy of the "ultra high definition" banner. The S9 series UHDs are both equipped with Samsung's newest smart platform, and take advantage of the unique "Frame TV" design aesthetic. The 110-inch S9 is available for a staggering $150,000. The 110-inch, curved UHD TV boasts an impressive 5,120 x 2,160 resolution, giving it a 21:9 aspect ratio—similar to what you'd find in an IMAX theater. The 110-inch S9 is currently the largest UHD TV in the world. The U9000 series boasts three curved UHD TVs in 55, 65, and 78 inches. The U9000 features an "Aero Arena" curved design, and each curved TV is a mere 1.2 inches thick with 7mm bezels. Like the S9 series, the U9000 series will use Samsung's Quadmatic Picture upscaling engine and is equipped with the company's latest smart platform. The U9000's PurColor technology enables a wider, and allegedly, more accurate color space, and each TV is HEVC/HDMI 2.0/HDCP 2.2 compatible. 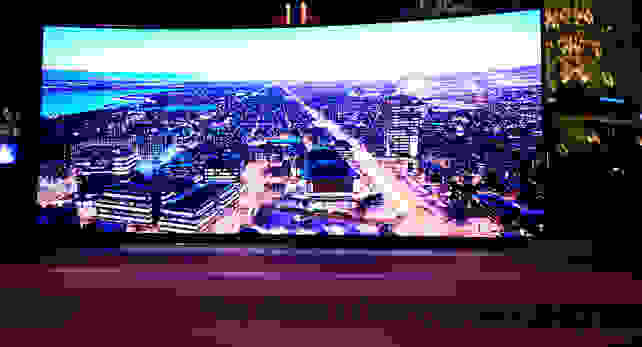 The three U9000 TVs will ship with Samsung's One Connect box, which externalizes connectivity ports. The more-versatile U8550 UHD series is available in four sizes: 50, 55, 65, and 75 inches. Like the U9000 and S9, the U8550 series TVs are smart, 1.2 inches thick, HEVC-compatible/HDMI 2.0/HDCP 2.2 compatible, and outfitted with the Quadmatic Picture engine. One of the biggest obstacles to UHD adoption is content. With few movies and TV shows available in a native UHD format, UHD televisions are forced to upscale HD content to fit the screen. Admittedly, a lot of great engineering has gone into creating those upscaling engines, but there's a natural desire for seeing the full potential of UHD. Samsung is attempting to meet those expectations through a number of strategic partnerships with content providers. Amazon, Netflix, M-GO, Comcast, and DIRECTV will all have streaming apps with UHD content, downloadable from the Samsung Smart Hub. Samsung will also offer a non-streaming option in the form of the UHD Video Pack, a hard drive pre-loaded with UHD movies from Paramount and 20th Century Fox Studios. Additional content can be downloaded and stored on the hard drive through the Smart Hub Multimedia panel. The hard drive will be available for separate purchase. No price was mentioned. The new H8000 LED TV series is available in 48-, 55-, and 65-inch varieties, and—despite being 1080p Full-HD TVs—the H8000 TVs are curved, too. Each H8000 model is equipped with an authentic 240 Hz panel, and will take advantage of Samsung's Micro Dimming Ultimate technology. Naturally, the H8000 TVs are smart and Evolution Kit-capable. Next in line, the H7150 series smart TVs are available in 55-, 60-, 65-, and 75-inch varieties. Similar to the H8000 series, the H7150 series features real 240 Hz panels, slim design aesthetics, and the newest iteration of Samsung's Smart Hub. So far, no pricing has been announced for either the H8000 or H7150 series. 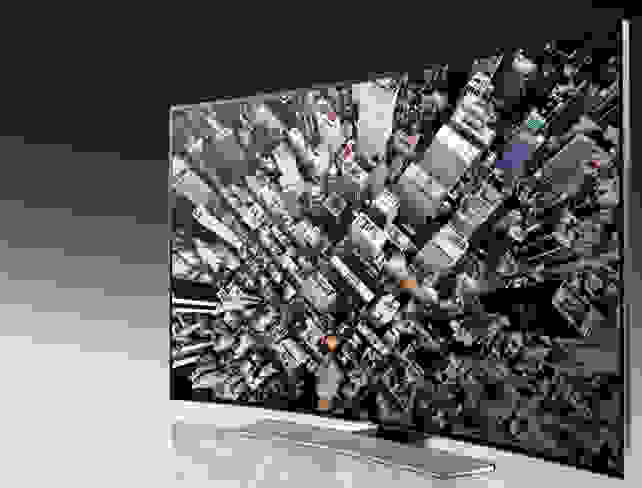 Samsung's UHD Evolution Kit, the SEK-2500U, helps to future-proof the purchase of Samsung's UHD televisions by allowing consumers to upgrade their TV's software to the latest version. The Evolution Kit is a compact unit that upgrades the Smart Hub and allegedly tunes the TV's hardware to the latest UHD specifications.